Home » Egyptian Ornaments and Decorations. 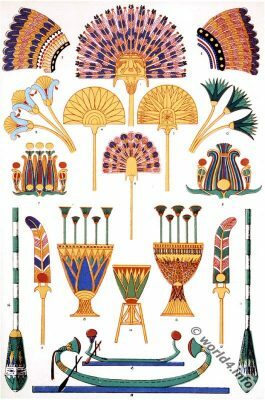 The variety of Egyptian Ornaments. The Architecture of Egypt has this peculiarity over all other styles, that the more ancient the monument the more perfect is the art. All the remains with which we are acquainted exhibit Egyptian Art in a state of decline. Monuments erected two thousand years before the Christian era are formed from the ruins of still more ancient and more perfect buildings. We are thus carried back to a period too remote from our time to enable us to discover any traces of its origin; and whilst we can trace in direct succession the Greek, the Roman, the Byzantine, with its offshoots, the Arabian, the Moresque, and the Gothic, from this great parent, we must believe the architecture of Egypt to be a pure original style, which arose with civilisation in Central Africa, passed through countless ages, to the culminating point of perfection and the state of decline in which we see it. Descriptions: Plate IV. Plate V. Plate VI. Plate VII. Plate VIII. Plate IX. Plate X. Plate XI. Inferior as this state doubtless is to the unknown perfection of Egyptian Art, it is far beyond all that followed after; the Egyptians are inferior only to themselves. In all other styles we can trace a rapid ascent from infancy, founded on some bygone style, to a culminating point of perfection, when the foreign influence was modified or discarded, to a period of slow, lingering decline, feeding on its own elements. In the Egyptian we have no traces of infancy or of any foreign influence; and we must, therefore, believe that they went for inspiration direct from nature. This view is strengthened when we come to consider more especially the ornament of Egypt; the types are few and natural types, the representation is but slightly removed from the type. 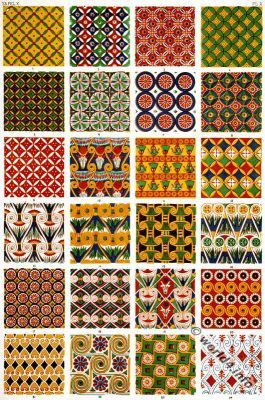 The later we descend in art, the more and more do we find original types receded from; till, in much ornament, such as the Arabian and Moresque, it is difficult to discover the original type from which the ornament has been by successive mental efforts developed. 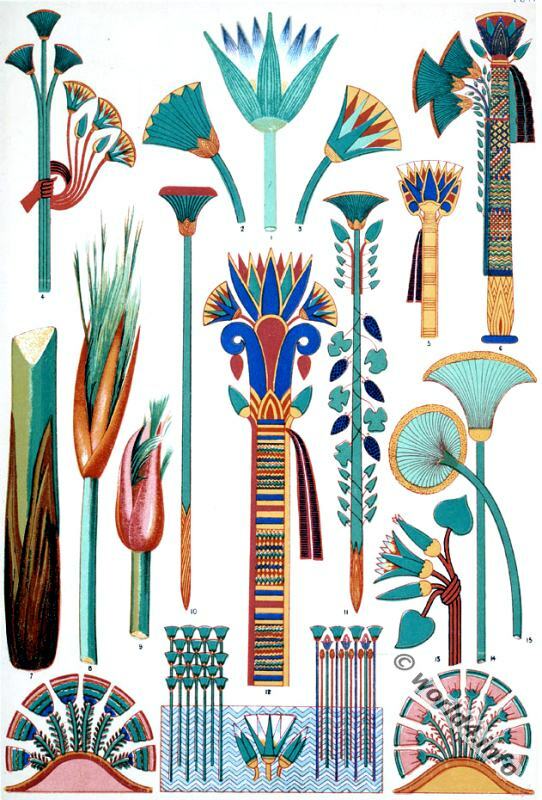 The lotus and papyrus, growing on the banks of their river, symbolizing the food for the body and mind; the feathers of rare birds, which were carried before the king as emblems of sovereignty; the palm- branch, with the twisted cord made from its stems; these are the few types which form the basis of that immense variety of ornament with which the Egyptians decorated the temples of their gods, the palaces of their kings, the covering of their persons, their articles of luxury or of more modest daily use, from the wooden spoon which fed them to the boat which carried their similarly adorned embalmed bodies across the Nile to their last home in the valley of the dead. Following these types as they did in a manner so nearly allied to their natural form, they could hardly fail to observe the same laws which the works of nature ever display; and we find, therefore, that Egyptian ornament, however conventionalized, is always true. We are never shocked by any misapplication or violation of a natural principle. On the other hand, they never, by a too servile imitation of the type, destroyed the consistency of the representation. A lotus carved in stone, forming a graceful termination to a column, or painted on the walls as an offering to their gods, was never such a one as might be plucked, but an architectural representation; in either case the best adapted for the purpose it had to fill, sufficiently resembling the type to call forth in the beholder the poetic idea which it was sought to supply, without shocking his feeling of consistency. Egyptian ornament is of three kinds: that which is constructive, or forming part of the monument itself, of which it is the outward and graceful covering of the skeleton within; that which is representative, but at the same time conventionally rendered; and that which is simply decorative. In all cases it was symbolic, and, as we have observed, formed on some few types, which were but slightly changed during the whole period of Egyptian civilisation. Of the first kind, viz. constructive ornament, are the decorations of the means of support and the crowning members of the walls. 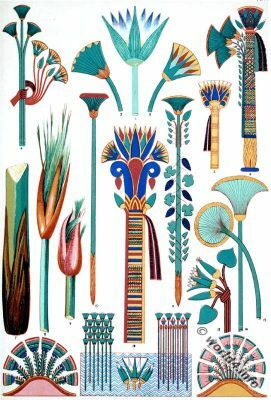 The column only a few feet high, or one forty or sixty feet, as at Luxor and Karnac, was an enlarged papyrus plant: the base representing the root; the shaft, the stalk; and the capital, the full-blown flower, surrounded by a bouquet of smaller plants (No. 1, Plate VI. ), tied together by bands. Not only did a series of columns represent a grove of papyri, but each column was in itself a grove; and at No. 17 of Plate IV. we have a representation of a grove of papyri in various stages of growth, which would only have to be assembled as they stand, and be tied round with a string, and we should have the Egyptian shaft and its highly – ornamental capital; and further, we have in Nos. 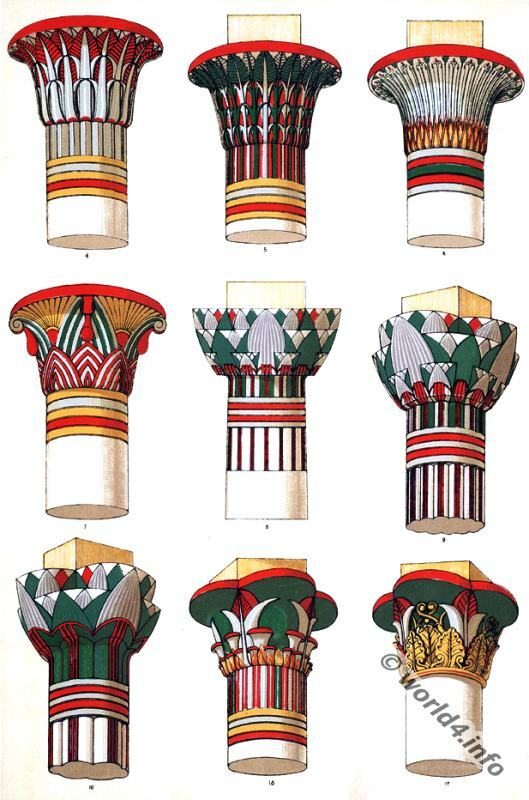 5, 6, 10, 11, 12, on Plate IV., painted representations of columns forming parts of temples, in which the original idea is unmistakably portrayed. 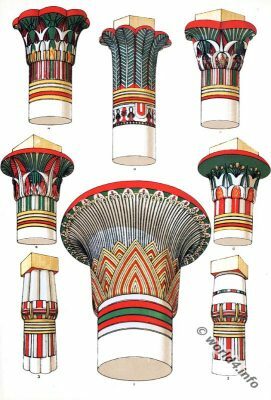 We may imagine it the custom of the Egyptians in early times to decorate the wooden posts of their primitive temples with their native flowers tied round them; and this custom, when their art took a more permanent character, became solidified in their monuments of stone. These forms, once sacred, their religious laws forbade a change; but a single glance, however, at Plate VI., will show how little this possession of one leading idea resulted in uniformity. 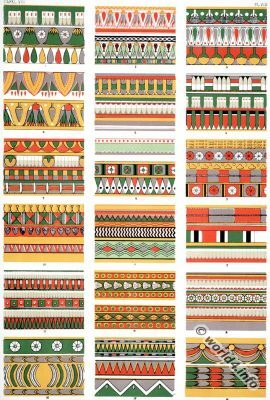 The lotus and papyrus form the type of fifteen of the capitals we have selected for illustration; yet how ingeniously varied, and what a lesson do they teach us! From the Greeks to our own time the world has been content with the acanthus leaf arranged round a bell for the capitals of columns of all architecture called classic, differing only in the more or less perfection of the modelling of the leaves, or the graceful or otherwise proportions of the bell; a modification in plan has but rarely been attempted. And this it was that opened the way to so much development in the Egyptian capital; beginning with the circle, they surrounded it with four, eight, and sixteen other circles. If the same change were attempted with the Corinthian capital, it could not fail to produce an entirely new order of forms whilst still retaining the idea of applying the acanthus leaf to the surface of a bell-shaped vase. The shaft of the Egyptian column, when circular, was made to retain the idea of the triangular shape of the papyrus stalk, by three raised lines, which divided its circumference into three equal portions; when the column was formed by a union of four or eight shafts bound together, these had each a sharp arris on their outer face with the same intention. 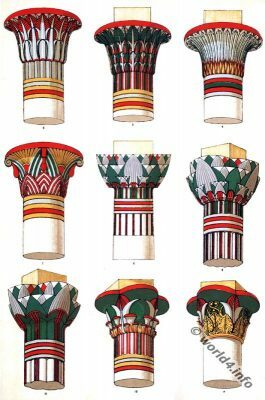 The crowning member or cornice of an Egyptian building was decorated with feathers, which appear to have been an emblem of sovereignty; whilst in the centre was the winged globe, emblem of divinity. The second kind of Egyptian ornament results from the conventional representation of actual things on the walls of the temples and tombs; and here again, in the representations of offerings to the gods or of the various articles of daily use, in the paintings of actual scenes of their domestic life, every flower or other object is portrayed, not as a reality, but as an ideal representation. It is at the same time the record of a fact and an architectural decoration, to which even their hieroglyphical writing, explanatory of the scene, by its symmetrical arrangement added effect. In No. 4, on Plate IV., we have an example in the representation of three papyrus plants and three lotus flowers, with two buds, in the hand of a king as an offering to the gods. The arrangement is symmetrical and graceful, and we here see that the Egyptians, in thus conventionally rendering the lotus and papyrus, instinctively obeyed the law which we find everywhere in the leaves of plants, viz. the radiation of the leaves, and all veins on the leaves, in graceful curves from the parent stem; and not only do they follow this law in the drawing of the individual flower, but also in the grouping of several flowers together, as may be seen, not only in No. 4, but also in their representation of plants growing in the desert, Nos. 16 and 18 of the same plate, and in No. 13. In Nos. 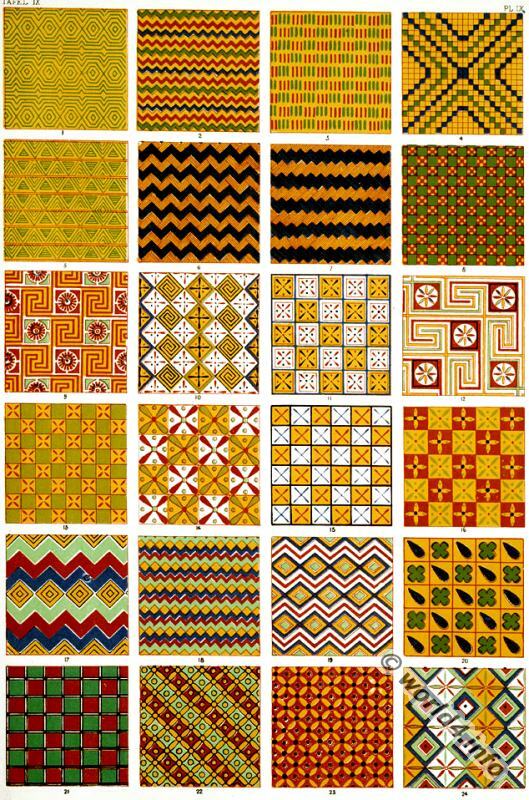 9 and 10 of Plate V. they learned the same lesson from the feather, another type of ornament (11, and 12, Plate V.); the same instinct is again at work at Nos. 4 and 5, where the type is one of the many forms of palm-trees so common in the country. 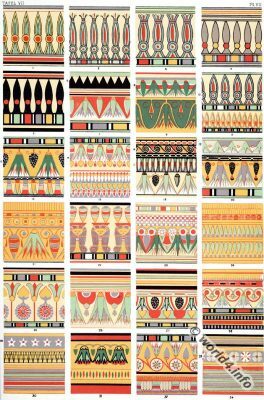 The third kind of Egyptian ornament, viz., that which is simply decorative, or which appears so to our eyes, but which had doubtless its own laws and reasons for its application, although they are not so apparent to us. 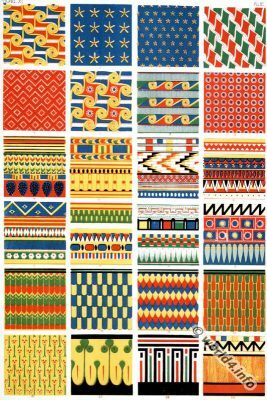 Plates VIIL, IX., X., XL, are devoted to this class of ornament, and are from paintings on tombs, dresses, utensils, and sarcophagi. They are all distinguished by graceful symmetry and perfect distribution. The variety that can be produced by the few simple types we have referred to is very remarkable. On Plate IX. are patterns of ceilings, and appear to be reproductions of woven patterns. Side by side with the conventional rendering of actual things, the first attempts of every people to produce works of ornament take this direction. The early necessity of plaiting together straw or bark of trees, for the formation of articles of clothing, the covering of their rude dwelling, or the ground on which they reposed, induced the employment at first of straws and bark of different natural colours, to be afterwards replaced by artificial dyes, which gave the first idea, not only of ornament, but of geometrical arrangement. Nos. 1-4, Plate IX., are from Egyptian paintings, representing mats whereon the king stands; whilst Nos. 6 and 7 are from the ceilings of tombs, which evidently represent tents covered by mats. Nos. 9, 10, 12, show how readily the meander or Greek fret was produced by the same means. The universality of this ornament in every style of architecture, and to be found in some shape or other amongst the first attempts of ornament of every savage tribe, is an additional proof of their having had a similar origin. The formation of patterns by the equal division of similar lines, as by weaving, would give to a rising people the first notions of symmetry, arrangement, disposition, and the distribution of masses. 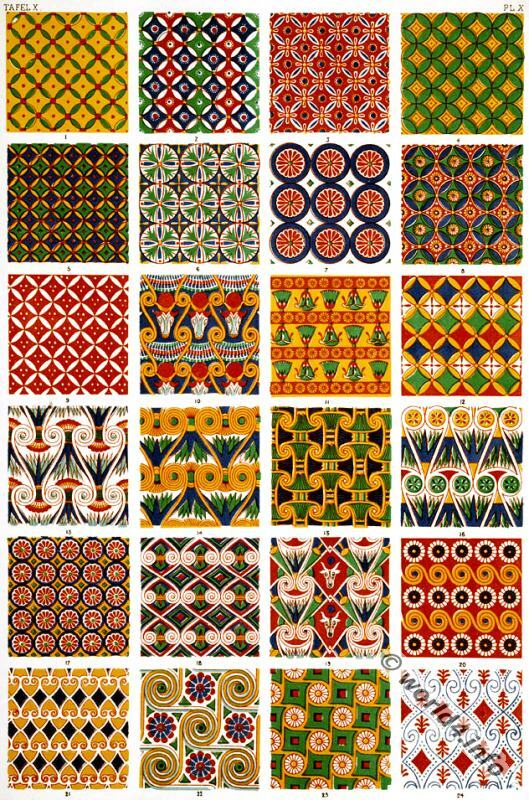 The Egyptians, in their decoration of large surfaces, never appear to have gone beyond a geometrical arrangement. Flowing lines are very rare, comparatively, and never the motive of the composition; though the germ of even this mode of decoration, the volute form, exists in their rope ornament. (Nos. 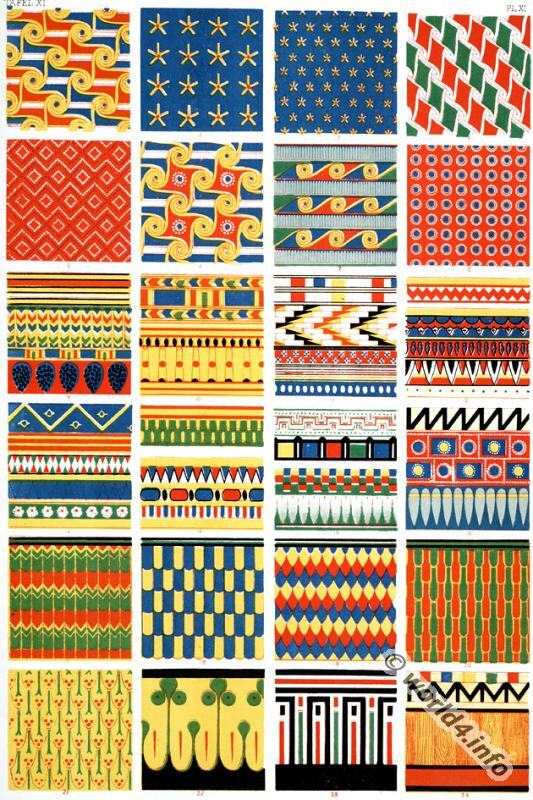 10, 13-16, 18-24, on Plate X., and 1, 2, 4, 7, Plate XL) Here the several coils of rope are subjected to a geometrical arrangement; but the unrolling of this cord gives the very form which is the source of so much beauty in many subsequent styles. We venture, therefore, to claim for the Egyptian style, that though the oldest, it is, in all that is requisite to constitute a true style of art, the most perfect. The language in which it reveals itself to us may seem foreign, peculiar, formal, and rigid; but the ideas and the teachings it conveys to us are of the soundest. As we proceed with other styles, we shall see that they approach perfection only so far as they followed, in common with the Egyptians, the true principles to be observed in every flower that grows. Like these favourites of Nature, every ornament should have its perfume; i. e. the reason of its application. It should endeavour to rival the grace of construction, the harmony of its varied forms, and due proportion and subordination of one part to the other found in the model. When we find any of these characteristics wanting in a work of ornament, we may be sure that it belongs to a borrowed style, where the spirit which animated the original work has been lost in the copy. 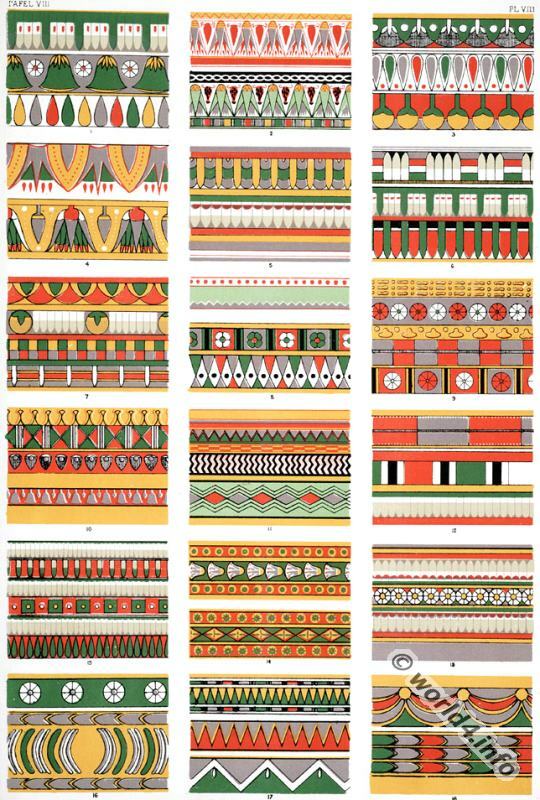 The architecture of the Egyptians is thoroughly polychromatic,— they painted everything; therefore we have much to learn from them on this head. They dealt in flat tints, and used neither shade nor shadow, yet found no difficulty in poetically conveying to the mind the identity of the object they desired to represent. They used colour as they did form, conventionally. Compare the representation of the lotus (No. 3, Plate IV.) with the natural flower (No. 1); how charmingly are the characteristics of the natural flower reproduced in the representations! See how the outer leaves are distinguished by a darker green, and the inner protected leaves by a lighter green; whilst the purple and yellow tones of the inner flower are represented by red leaves floating in a field of yellow, which most completely recalls the yellow glow of the original. We have here Art added to Nature, and derive an additional pleasure in the perception of the mental effort which has produced it. 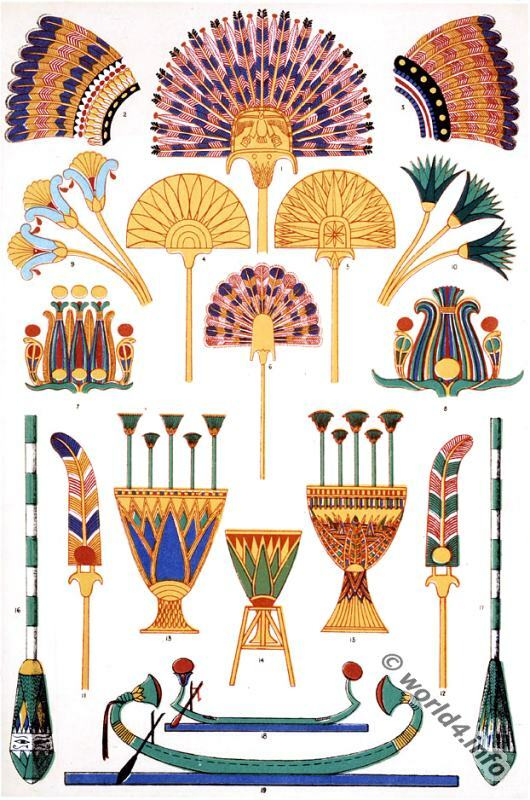 The colours used by the Egyptians were principally red, blue, and yellow, with black and white to define and give distinctiveness to the various colours; with green used generally, though not universally, as a local colour, such as the green leaves of the lotus. These were, however, indifferently coloured green blue; blue in the more ancient times, and green during the Ptolemaic period: at which time, also, were added both purple and brown, but with diminished effect. The red also, which is found on the tombs or mummy-cases of the Greek or Roman period, is lower in tone than that of the ancient times; and it appears to be a universal rule that, in all archaic periods of art, the primary colours, blue, red, and yellow, are the prevailing colours, and these used most harmoniously and successfully. Whilst in periods when art is practised traditionally, and not instinctively, there is a tendency to employ the secondary colours and hues, and shades of every variety, though rarely with equal success. We shall have many opportunities of pointing this out in subsequent chapters. 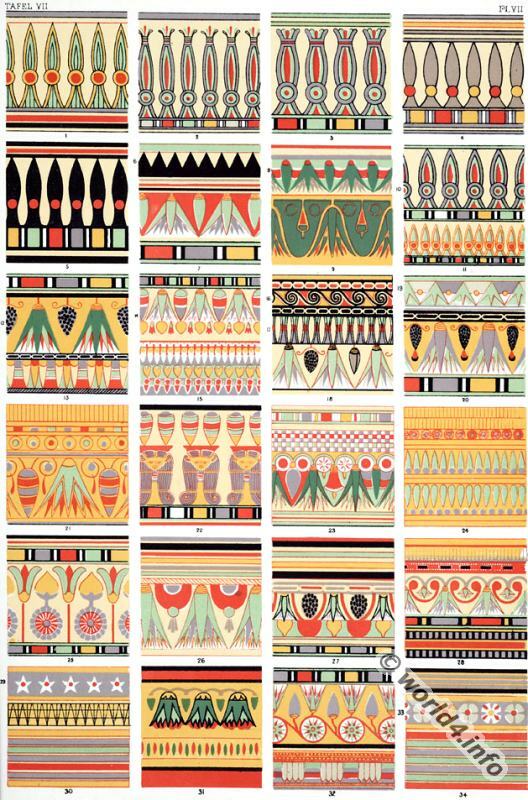 Associated to: Egyptian Costume History.